I guess over the next few weeks is when this thread really gets interesting, will be looking forward to it. What are the early guesses on Switch? RE7 doesn't seem great at 10k imo and I guess as some where saying the numbers down the line are a lot lower than they use to be. It was still an ugly design though IMO. Especially compared to Yoshida's stuff for Automata. It's so close to 200k could it be that it only shipped 200k and basically sold out? I saw that it sold like 70% of the first shipment on day 1 in the other thread. What's the situation in the stores Japan residents? Either way, really glad for Nier. Wow, WiiU sales have completly tanked. I believe supply is nearly nil at this point. I don't think it's from demand being lower than XB1. Someone please correct me though if I'm wrong. Decent numbers for SRWV I guess. Still not doing anything to reverse the series' overall downward trend. Needs ~8k per week to be first at 4.5m. 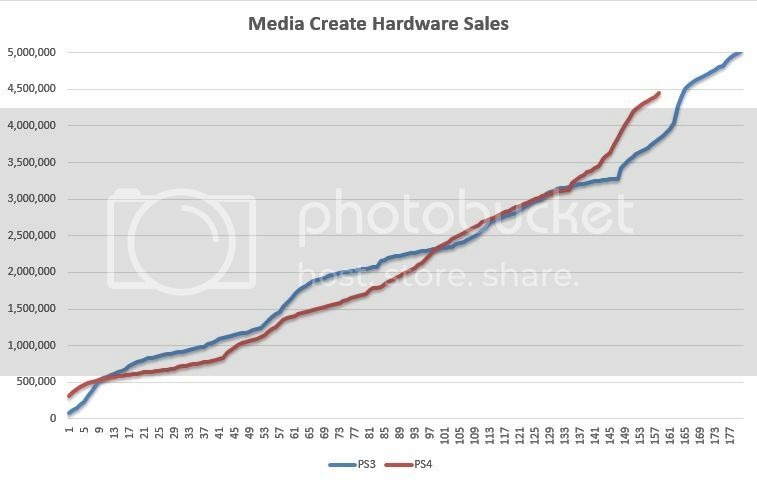 Sales of PS3 were so bad that you have jumped 9 weeks or is it a typo? What are the required sales for PS4 to reach 5.0 m before PS3? So, Nier already outsold Bayonetta in JP? Really happy for both Nier and SRW V. I'm curious about their holds and the ones for RE and Nioh next week! They finally gave Taro a decent budget and a good team to work with, it's great to see them succeed. Here's hoping for many more. Damn, those are even better sales than expected for Nier. Big win for Yoko Taro and for Platinum games. I don't quite understand what this particularly entry should be compared to within the series. The last OG Saga game? Which it beat quite comfortably. The last Masou Kishin game? Yeah, that one bombed lol. The 3rd Super Robot Wars Z games? Yeah, it did lose to those admittedly. That had a lot of hype from being the last in that particular series though, I believe? Seems to be a more popular sub-series in general though judging by the sales of the PSP & PS3 entries. The last Super Robot Wars' with random letters at the end? So yeah, I don't quite understand how this series works, but I don't understand where the 'downward trend' part is coming from since the only thing it seems to be down from is Super Robot Wars Z series? Fixed... I jumped from 160 to 170... crazy... the sales numbers are right. Zelda Breath of the Wild is the most pre-ordered game by far. Pre-orders are 5 times higher than 1-2-Switch, the second most pre-ordered game. Bomberman R is third and Dragon Quest Heroes 1-2 is fourth. Regarding the profile of users, not only the usual Nintendo fans, also people who enjoy Dragon Quest and Monster Hunter, and other light users have Switch pre-ordered. He has the impression that a new audience is interested on the system, different from the typical Nintendo. Average of 26.095 units weekly. Huh? How is that surprising? DQ and MH are on 3DS. Yeah lol I'd have never saw that coming. Monster Hunter audience buying a Switch and Capcom not even releasing it on Switch(for now anyway). I imagine a good reason why Automata has fared much better than the first Nier is because its main character doesn't have a face like a constipated moose. Blasphemy! Papa Nier > yet another waifu. Good numbers for Nier. In its lifetime and after PC sales can we assume over 1 million? Pretty much expected for Japan when Capcom switched to first person, RE7 as a whole is very much focused on the western audience. Damn, Nier + PS4, very nice. I feel like they really needed a success right about now, and from I've read Automata is a great game and a worthy follow up to Nier. I wonder if Saito considers this to be "selling like hotcakes"? Pls remaster/remake the original Nier you dream team you. If Nintendo shipped enough units I def can see Switch having better FW than the 3DS. May I ask why? Or is it a convoluted "that's how the series works" kind of thing? Amazing result for Nier, is the first shipment completly sold out? V is the replacement series for Z. The games usually do worse with each successive entry, so opening lower than the last Z isn't a good sign. This White Slim launch was a disappointment in terms of sales. Well, for you maybe, yeah... seems like it. Z games are the only mainline series effectively. Anything published on the nintendo platforms is 2nd rate and inferior in quality to the mainline entries. Masou Kishin games are made by a different developer which is now bankrupt. Despite what some attention seeking poster claimed in a thread title. OG games do not have any of the licensing. They are remakes of older games with all the licensed stuff stripped out. It's not that confusing but you need to have the proper knowledge I guess? OG Saga are the titles in the series featuring only original characters and mecha designs, Moon Dwellers were a spin off of OG Saga as the game was not a numbered entry. Masou Kishin are a low effort spin-off centered on a side character of OG Saga, it never did well. Super Robot Wars Z were the lead entries in the series for 7 years on PSP/PSV/PS3, they got the bigger budget and marketing push, popular IP, new animations etc. If V is supposed to be its replacement then it just continue the downward spiral the IP has been on for a few years and doesn't bode well for its sequels. If you compare sales between all subseries you'll notice that the sales are on decline for every one of them, 3DS entries compared to DS entries, V to Z, Masou Kishin to its previous entries, OG 2 from OG etc. Bayonetta 2 sure, but not the original. They announced it as a standalone entry, but yeah it's pretty much a sequel to the Z games. Still, Nier is quite a niche ip that beating RE7 anywhere is not something I'd expect. It actually beat RE number first week lol.^^ Nier is bigger than RE now in Japan lol. Nice result for Nier. Hopefully it does well overseas, although I'm a little concerned it will get lost with all these big releases going on. Wow. Wasn't expecting to see the day where nier sold better than a mainline resident evil in my lifetime. But looks like it deserves It. I would get the game if It wasn't for Zelda. SRW V probably the closer equivalent to MX than Z or @, to be fair. I thought V was a one off? And the sales aren't that surprising considering the series represented. Their one off titles for the past while have always seem to have had low sales. Looks like Yoko Taro won't have to worry about his game releasing a week before the Switch after all. Cograts to Nier and Yoko Taro. Game looks amazing and I can't wait to get in there. Hopefully this means SE will entrust YT with more projects. Also waifus for the win. And FFXV continues to sell after three months. I am curious how it will do when episode gladio comes out at the end of the month.